Adults may find turkey dry and tasteless, but for Tuyet a turkey is symbolic of being the cultural majority, of fitting in, doing what one is supposed to do. 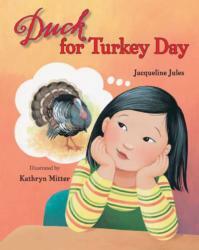 Duck for Turkey Day follows a little Vietnamese American girl, Tuyet, who’s terribly upset her family is having duck for Thanksgiving. What follows is an engaging story of accepting of one’s heritage as well as general diversity. Immigrants often have to negotiate how to preserve and honor their traditions while allowing their children to grow up American, and this book portrays a matter-of-fact immigrant family that plans on cooking some delicious duck regardless of what their little girl thinks. Some parents may give in to their Americanized kids and cook American food, but as Tuyet finds out, some of her classmates had noodles, enchiladas, or tofu turkey on “turkey day” as well. The valuable lesson here is that a multiethnic America does not have to require conformity, and a “cool” meal does not have to be the typical American one. All in all, this is an educational and approachable book, made additionally appealing by Kathryn Mitter’s clean and bold illustrations which have a crisp, paper-cut-out quality to them. By omilaju in Asian Child, First Generation American, Girl Protagonist, Vietnamese on April 4, 2015 .